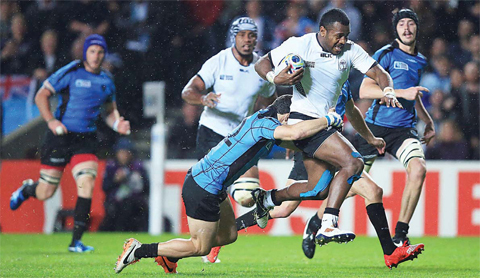 LONDON: Fiji and Romania recorded their first victories of the World Cup on Tuesday as teams began to bid farewell to the tournament and those remaining prepared for a weekend that will decide the quarter- final line-ups. Hosts England rang the changes for their final game, a dead rubber against Uruguay, and the debate over Stuart Lancaster’s future continued with another seasoned coach stating his interest in a role that has yet to become available. The final three last-eight berths will begin to be filled from Wednesday with South Africa expected to confirm their spot when they take on the United States. England’s executioners Australia were dealt a blow ahead of their Pool A decider with Wales and hopes of an easier path to the last four when flanker Michael Hooper was banned for a week and Israel Folau deemed a doubt with an ankle injury. “We have got a squad of 31 and that’s the reason you have a squad of 31,” attack coach Stephen Larkham said ahead of the game in which the losers are likely to face twice world champions South Africa in the quarters. Fiji played their final part in Pool A-the group of death by running in seven tries in a 47-15 win over Uruguay who grabbed their first try of the tournament. The biggest cheer and wildest celebrations of the night came when Carlos Arboleya, 12 years after Uruguay coach Pablo Lemoine scored their last World Cup try, crashed over the line to be mobbed by all 22 Uruguayan squad members. In the day’s other game, Florin Vlaicu nervelessly slotted a penalty three minutes from time to lift Romania to the biggest ever comeback win at a World Cup with a 17- 15 Pool D victory over Canada. Romania, who have one final match against Italy on Sunday, trailed 15-0 early in the second half until their pack began to smash the Canucks, setting up a grandstand finish in which Vlaicu duly delivered. “I don’t think it was ever in doubt really, was it?” Romania’s Welsh coach Lynn Howells told reporters with a smile. “They’ll have a beer, but it’s not going to be to any great extent… Semi-final won, now we play the final,” Howells said, referring to the Italy match in which an upset would seal automatic qualification for the 2019 World Cup. For hosts England, coach Lancaster attempted to look to a future in which he may play no part by handing Jack Nowell and Henry Slade their first World Cup starts among nine changes to the side that got dumped out of the tournament. While the English coach was determined that his team stay positive and block out the “huge” noise on the outside, World Cup-winning South African Jake White joined the line formed by Japan coach Eddie Jones to potentially replace Lancaster.